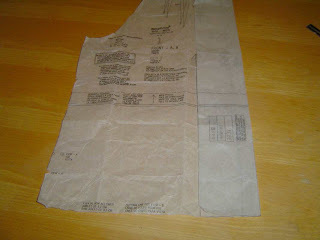 Before I show you the finished coat, I wish to share, step by step, how I made the lining for Simplicity 3631. 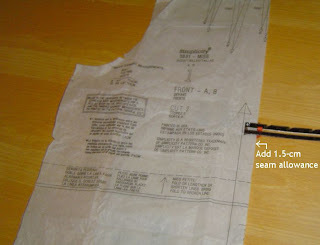 This may help other beginner/intermediate seamstresses and seamsters who haven’t yet tackled lining a coat or a jacket. I lined the coat entirely. An unlined fall/winter coat doesn’t make any sense in Paris… especially this year! It’s been a really cold season. Now, not only did Simplicity 3631 not have any pattern or directions for a lining; this was also the first time I lined a coat or jacket. This required a good deal of reading and mulling over; a few friends also kindly offered advice and encouragement when I mentioned my thoughts on the lining here. Thank you, Carolyn and Tany! Thanks also to everyone who encouraged me on the way. I didn’t exactly bag the lining, because this is not a jacket with a regular collar and back facings. 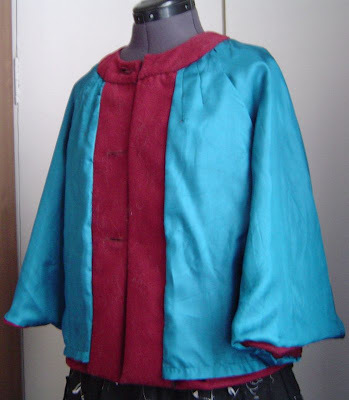 This is a jacket with front facings and a neck band. 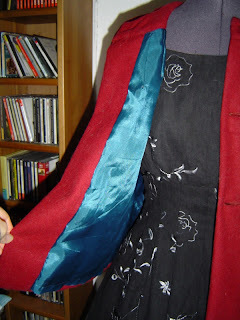 As I explained in the third part of this entry, I simply stitched the shell’s and lining’s fronts together at the sides, turned them inside out, hemmed the sleeves by machine, turned the jacket right sides out, and then sandwiched the two layers, wrong sides together, between the neck band. I cut the front and back pieces slightly shorter than the shell, but left the full length in the sleeves. I liked the idea of the turquoise showing discreetly when I lifted the arm. I added an inch to the back’s middle, in order to create a pleat for added ease. I cut the sleeves as per the original pattern. At this point, I read about Carolyn’s jacket; Carolyn also lined her 3631 jacket, and funnily enough, we made most of it on the same weekend (well, she finished hers; I almost finished mine, but then sprained my foot, and the jacket suffered a two-week hiatus). I decided to follow Carolyn’s lead and keep the lining and shell’s hems independent. I therefore hemmed the lining by machine and the shell by hand. 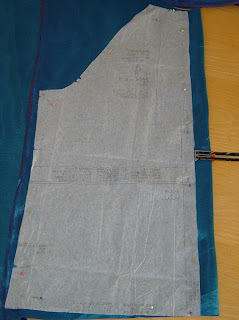 Tany had given me a great tip when we met in Paris about adding fusible interfacing to the hem, to give it shape. She also shows it very well here. It also helps greatly for stitching an invisible hem. I stopped the invisible hem 1 cm before the facing. OK, this picture is slightly misleading. 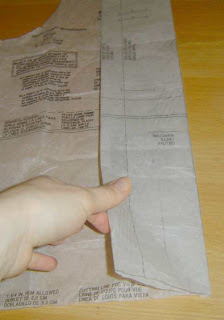 Here, I had started hemming the shell with the project of assembling the lining’s and shell’s hems. Only after did I read Carolyn’s post and decided to keep the hems separate. I therefore ripped this and folded over the hem twice instead of once, for a more finished look. 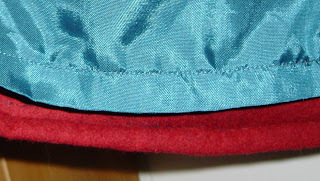 However, it does show you where I started the hem: just beyond where the facing would be folded over itself. I sewed the shell’s and lining’s front edges together (right sides together), stopping a few inches before the bottom. I stitched the shell’s facing as per the pattern’s instruction: folding it to the outside (the right side) of the jacket and stitching the bottom edge, then trimming the seam, and finally turning it to the inside. I turned the jacket to the right side, pinned the shell and lining along the neckline, and added the collar as per the pattern’s instructions, treating the shell and lining as one. I stitched the collar to the outside by hand, unlike the pattern’s instruction which tell you to stitch in the ditch. Stitching in the ditch is much less neat than slipstitching for an invisible seam. After all the work I’d already devoted to this coat, I thought it deserved the extra niceness of a hand-tacked collar. The picture was taken on a sunny day without the flash (the flash makes the lining much shinier than it really is), and this is the closest I could get to the lining’s and outer fabric’s true colours. In real life, the turquoise is just a tad darker. Wow! That was long. I hope this step-by-step tutorial may help some. I’ll be showing you the finished coat very, very shortly… Promise! If I ever dare undertake something so complex, I certainly know where to come for instruction! This looks like a brilliant tutorial, Isabelle, and I’m sure it’s going to be of value to a lot of people! Very pretty! And great tips! TFS! This makes perfect sense to me, thank you.I just bought a vintage coat, and the lining and shell are hemmed separately; I love it. ooh that’s fantastic! And I utterly ADORE your colour choices! !I would’ve never thought to hem the outside and the lining separately – does it not shift around when you sit down or belt the jacket? Beautiful and chic color choices! It is really interesting to see both interpretations of the jacket from you and Carolyn. Great tutorial, Isabelle and I agree with Summerset, such beautiful color choices! I LOVE the colors together. They are lovely! Great job! Isabelle! I love the jacket and the lining really makes it special. I had forgotten to update your knew link… glad I “found” you again! Isabelle – this just piqued my interest! *smile* But I am so glad that my experience was helpful to you…only you are wearing your jacket as an outer layer and mine is worn more as a suit jacket…and I am dying to see how you handled the sleeves! Thanks for the detailed instructions; they’re always great to refer back to later. I look forward to seeing your coat, I’m sure it looks wonderful. Love how your jacket turned out! I’m a beginner and your tutorial will be extremely helpful to me when I try my hand at lining this same jacket. I was starting to think of leaving mine unlined but with your post I think I can handle it now. Thanks so much! The jacket is lovely, and the lining is especially pretty. I would be tempted to wear it inside out. Thanks for the tips too. Beautiful coat. Great color combination. This was another very helpful tutorial!Your attention to detail and technique has inspired me to rip out the sleeves on my own red jacket to reknit them more flatteringly (adjust sleeve cap from dropped shoulder to more fitted, narrow width of sleeves).I never would have tried anything nearly so technical as reshaping a sleeve cap before I found your blog and began learning from you!Merci beaucoup, ma chère amie! Kiwi:First, it would help if you left a way to reach you! 😉Second. I did this while having a badly sprained foot, and believe me, taking pictures was not easy. Please, be understanding. I only did this to help! And I am not getting paid for this, you know 🙂Third. I am not sure what you are asking about. Could you be a little specific? I cannot think of a step where I had to fold the lining on the outside. That is probably why there are no pictures of this step? LOLLet me know! Thank you! You made it seem funny and easy to do you have a great sense of humor and the tutorial makes sense! !